High Pressure Oil Pump O-ring kit contains 10 Viton® O-rings, 2 Hose locking rings, 2 hose spacer rings, IPR Split washer and a packet of Locktite 680 retaining compound. Ford's Factory part# is 2C3Z-9G804-AA only has 3 o-rings (2 discharge hoses and rear plug) and retails for 30% more than this kit. 1. The O-ring that seals the IPR to the HPOP. 2. IPR internal seal O-ring and split washer (full IPR reseal kit). 3. The O-ring needed for the fill plug at the top of the reservoir. 4. TWO O-rings for the inside of the high pressure hose connectors that seal the hose to the pump. 5. TWO O-rings for the HPOP fitting threads. 6. TWO interior hose fitting PTFE backup spacer rings. 7. TWO hose fittings stainless steel hose locking rings. 9. O-ring for the pressure port plug on the passenger's side front of the pump. 10. 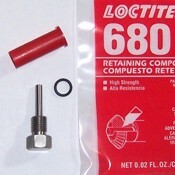 Packet of LocTite 680 to seal the hose fittings and rear plug in the pump. 11. O-ring for the 18mm plug on the rear of the pump. This kit does NOT contain the rebuild kits for the engine side of the High Pressure Hose Fittings - Please see part #8-028 if you are needing to rebuild the engine side of the system. 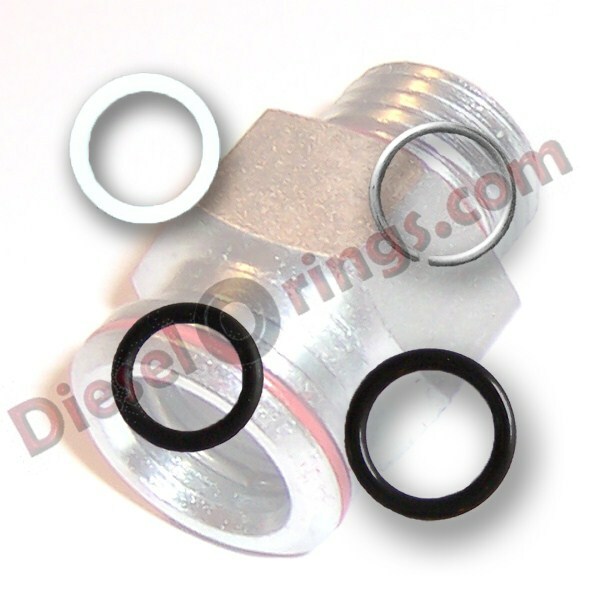 Complete Hose fitting repair kits include all interior and exterior replaceable parts. HPOP O-ring replacement:Download PDF file Here. 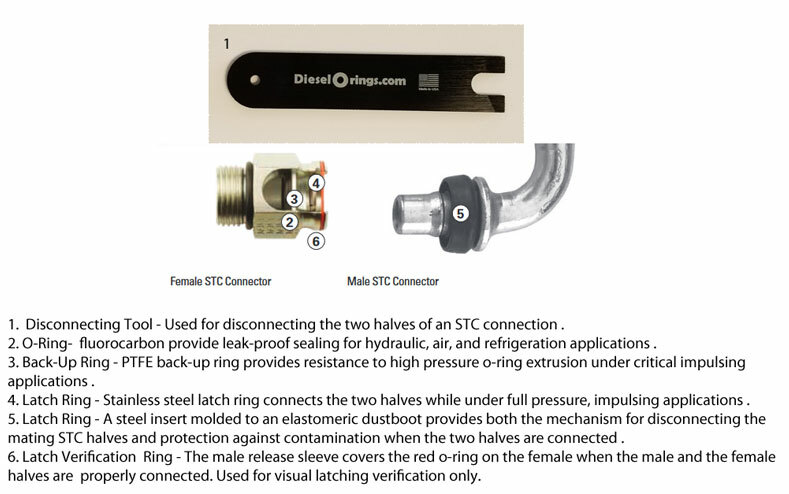 HPOP Hose fitting repair procedure:Download PDF file Here. HPOP "New Serviceable Plug" replacement: Download PDF file Here. Order quantity of 1 for each repair kit. Before removing the HPOP, it is necessary to remove the fuel canister on the 99-03 7.3L. The 4 hard lines will require new sealing sleeves as these are not reusable and will leak if attempted to be reused. 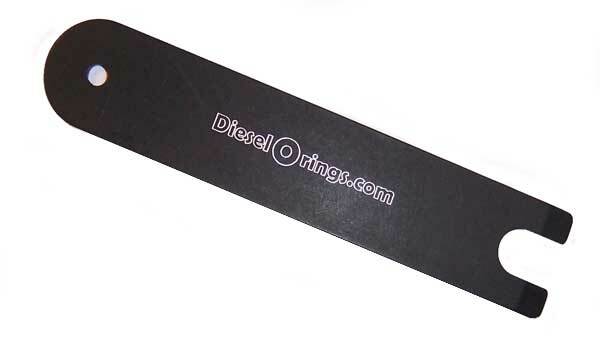 The High Pressure Oil Pump hoses on the 1999-2003 Ford 7.3 diesels have a quick release style of hose end that requires a special tool to disconnect the hoses from the pump and the head fittings. Some have used screwdrivers to release the connection but it is easy to damage the hose without the proper tool. You can easily add this tool to your order along with the HPOP kit by adding it to your cart using the check box above. LEAKING "non-serviceable plug"? Now it is SERVICEABLE! If your "non-serviceable" plug at the bottom of the HPOP is leaking, it is probably due to the short threaded plug stripping the threads from the aluminum HPOP body. We now offer a new 'long threaded" plug made from high quality 303 stainless steel . This plug can sucessfully repair a HPOP "non-serviceable" plug that has completely stripped out the factory threads. Add this kit to your order by adding it to your cart using the check box above. 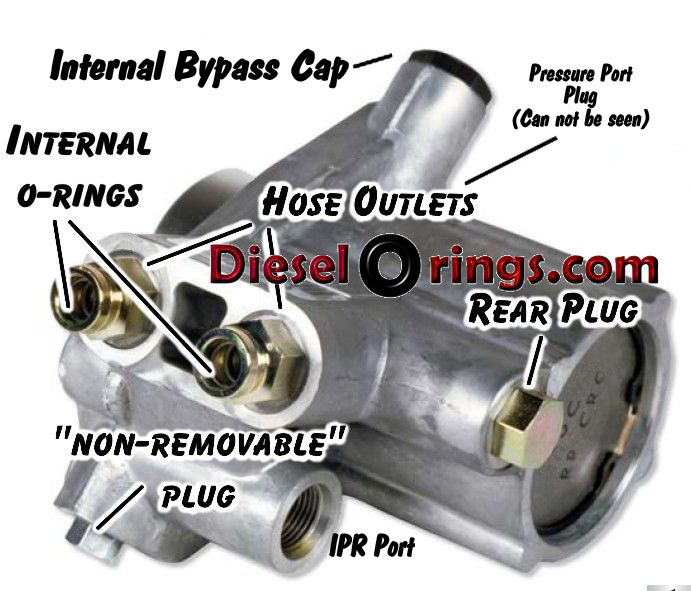 The HPOP must be removed to replace the "non-serviceable" plug and the HPOP to front engine cover is not reuseable. 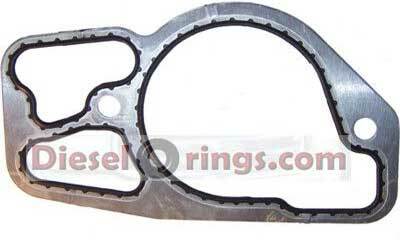 Order a new Ford/Navistar gasket by adding it to your cart by usingthe raido button choices above.